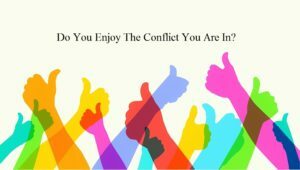 Do You Enjoy The Conflict You Are In? One of the most common source of time and energy spent in an office is on conflicts. In some cases, the conflict never gets resolved but swept under the rug or ignored and team members go on with work where resentment builds. Without long term solutions, the team works in a sub-optimal work environment and office culture suffers which then results in ineffective teams providing less than optimal care to their clients. The caveat is that people like conflict! I know it sounds untrue but you like the conflicts you are in. You like that your co-worker is difficult to work with, your employer lacks leadership and your poor communication is rampant throughout the office. You embrace the trouble people are creating for you. This all sounds crazy. So, the question becomes; Who in their right mind wants conflict? No one! Then why do we invite conflict into our lives? As discussed in The Anatomy of Peace by the Arbinger Institute, it happens the moment that we stop seeing others as people but instead as objects in which others don’t matter like I matter. When you are seeing others as people, others matter like I matter and they count like I do. When we choose to see others as objects and fail to see that they count as we ourselves do, we create within ourselves a new need. We create the need to be justified for our objectification of others- a need that gives a reason to like problems more than solutions and mistreatment more than cooperation. For example, my hygiene trays were not set up properly. I know it would be helpful to breakdown and set up the hygiene trays but I choose not to. I am busy and choose to do other duties like chart notes and stocking so my day will go smoother. Tray set-up is the responsibility of the assistant. In my lack of teamwork with the hygiene trays not being completed, my resentment is projected on to the dental assistant. In my mind, I view the assistant more critically than I might otherwise be toward her and justify my view of not helping. The assistants’ faults become more inflated in my mind. I now have incentive to view her as incompetent or lazy. I need to view her badly so I can be justified for treating her poorly. Conversely, how will the assistant respond to me when I am treating her as if she is incompetent or lazy? Will she be more helpful or cooperative with me? No, she will most likely respond with the same unkind or worse manner in which I provoked. The more critical I am of someone the more unlikely they are to engage with me positively. Why do we like conflict? That question lies in my views of the other person. The worse my colleague treats me, the more my negative views of her will seem justified. This justification proves that I am right about my colleague. This self-justification leads to me feeling innocent regarding my part in the conflict. This position absolves me my responsibility to the conflict and continues a pattern of blame. In our view of people as objects, we continue to see people poorly which invites them to respond in the same or worse manner toward me. It is our treatment toward others that continues this perpetual cycle. This cycle leads to mistreatment which I then use as my justification and the cycle is sustained. Because of this mindset, I value problems more than solutions and conflict more than resolution. In objectifying another, we search for justifications that support our position in the conflict. This does not support finding solutions for our conflicts. To rid ourselves of the justification cycle, we need to see others as people so they matter as I matter. Seeing a conflict partner as people with hopes, dreams, cares and fears as real as our own helps to diffuse the justification and lead us toward conflict resolution. Applying self-awareness to your conflicts helps uncover the ways we stay in conflict through justification and objectifying the other person we collude with. It is discovering our role in conflict that leads to the change in a positive outward mindset that supports long-term solutions to long standing problems. Challenge yourself to find a solution to a conflict that has been negatively affecting your workplace. What is your role? How might you resolve it? Encourage yourself to view the conflicts you are involved in with new eyes and an opportunity to have improved relations and conflict resolution that is lasting- be the change you want to see in the world.